The Bible of St. Louis is one of the most beautiful manuscripts of the Gothic tradition from France. The codex, also known as the Rich Bible of Toledo, was written and illuminated in the second quarter of the 13th century in Paris, featuring countless miniatures of exceptional quality. The Bible of St Louis contains only a selection of biblical texts provided with commentaries. To both types of texts was given the same importance in terms of decoration and space. Detail of the ADEVA facsimile edition of the St. Louis’ Bible. 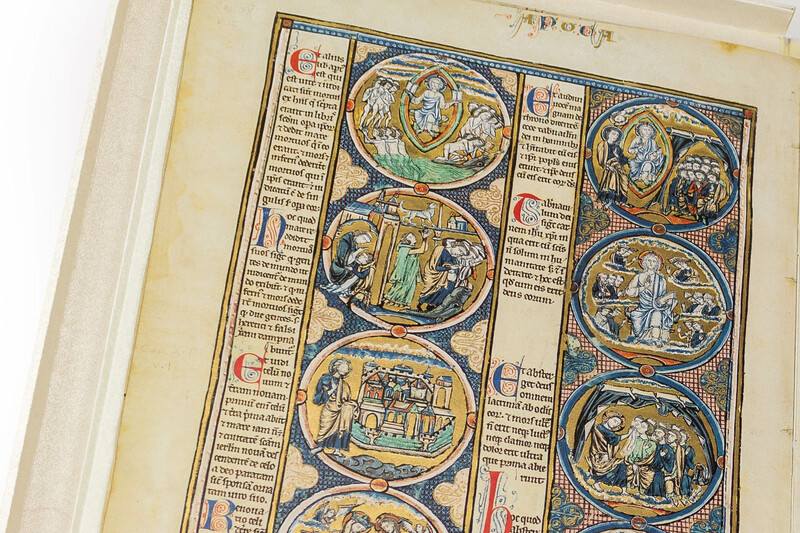 Written in Latin and created between 1226 and 1234, this work is a bible moralisée, functioning both as educational and pedagogical tool for kings. The earliest record of the Bible of St Louis emerged in the testament of Alfonso X, dated to 1282, in which the codex is described as a bible of three illuminated volumes donated by King Louis of France. The Bible of St Louis was produced, among a few other manuscripts, for the Capetian dynasty – French royalty – who were among the very few personalities who could afford such lavishly illuminated manuscripts; indeed, the high costs of production lead to the creation of only a few specimens of this type of book. The codex is certainly a great example of magnificence, from the very large format to the number of folios. It is worth noticing that due to the large amount of decoration on each page, one side of each folium was left blank so as to avoid any pigment soaking through to the other side. Check out our high resolution digital gallery of the St. Louis’ Bible facsimile editions and pick the one for you! The iconographic apparatus features 8 medallions per page depicting the scenes described in the text. Each medallion exhibits high technical skills on behalf of the artists who make use of a wide range of colors on gold grounds, however, both workshop and artistic team remain unknown if not for the last miniature depicting two regal figures and two of lower rank. It has been suggested that while the two regal figures represent Blanche of Castile and her son Louis IX, the two subordinates respectively could depict a cleric and a copyist – both without any recognizable traits – leading us to believe to a collaborative authorship for the creation of such magnificent codex. It is unclear why exactly the St. Louis Bible was commissioned, although the fact that the it was created during the school years of the prince of France could suggest its use as an instrument of reference in his education. It seems clear that it was commissioned by Blanche of Castile, the mother of Louis IX for her son, the king of France, whose both portraits appear in the last illuminated folio. It seems also certain that the codex was later donated to Alfonso X, King of Spain. Some of the leaves of the manuscript were detached around the 16th century and ended up in the collection of the Morgan Library, New York. The rest of the codex is treasured at Santa Iglesia Catedral Primada, in Toledo. As a result, different facsimile editions of the Bible of St. Louis were created, some reproducing only the detached leaves and others replicating the manuscript in its entirety before being torn apart. Go check them out!